← RECOMMENDED: Flipflop 2009 Merlot, California. 13.5% ABV, $4.99. APPEARANCE: Very light straw color, almost clear. NOSE: Similar to Sauvignon Blanc; grapefruit and lemon. Gravel, pears, apricots, cantaloupe. TASTE: Slightly frizzante. Melon, green, crisp and acidic, almost tart, a little lemon and tangerine, honeysuckle. Off-sweet and reminiscent of one of the many types of good Rieslings. MOUTHFEEL: The significant percentage of Viognier added a silky, buttery, creamy texture and weight which I loved. An interesting (there’s that word again) contrast from the frizzante first impressions. FINISH: Lasting sweetness. Another unexpected contrast from the almost tart taste. LABEL NOTES: Our distinctive blend, first created here at Pine Ridge Vineyards in 1979, marries the crisp apple, pear and citrus fruit of Chenin Blanc (79%) with the rich peach, lemon and honeysuckle flavors of Viognier (21%) for a lush and delicious wine. Pair this versatile bottling with fresh salads, seafood and spicy dishes for a delectable meal or savor on its own. I wouldn’t mind pairing this with Tom Ka Gai soup or some other spicy/savory/sweet fare. Established in 1978, Pine Ridge Vineyards founder Gary Andrus was “inspired by the illustrious wines of Bordeaux [and] believed in the Napa Valley’s potential to produce wines of similar stature. He planted the property’s original namesake vineyard on a steeply terraced hillside flanked by a dramatic ridgeline of pine trees in the Stags Leap District. Gary’s pioneering efforts with this first vineyard were met with tremendous success as the Bordeaux varietals he planted—Cabernet Sauvignon, Cabernet Franc, Malbec, Petit Verdot—thrived and produced wines of great distinction. In the following years, Pine Ridge continued to acquire exceptional vineyard sites across the region. Today, the Estate’s 200-acres span five renowned Napa Valley appellations—Stags Leap District, Rutherford, Oakville, Carneros and Howell Mountain.” Their property even includes a mile-long system of caves in which they age and store some of their wines. However, the winemakers aren’t afraid to source their grapes from elsewhere. The Chenin Blanc grapes came from Clarksburg, and the Viognier from Lodi. This entry was posted in California, Chenin Blanc, Viognier, White Blend. Bookmark the permalink. 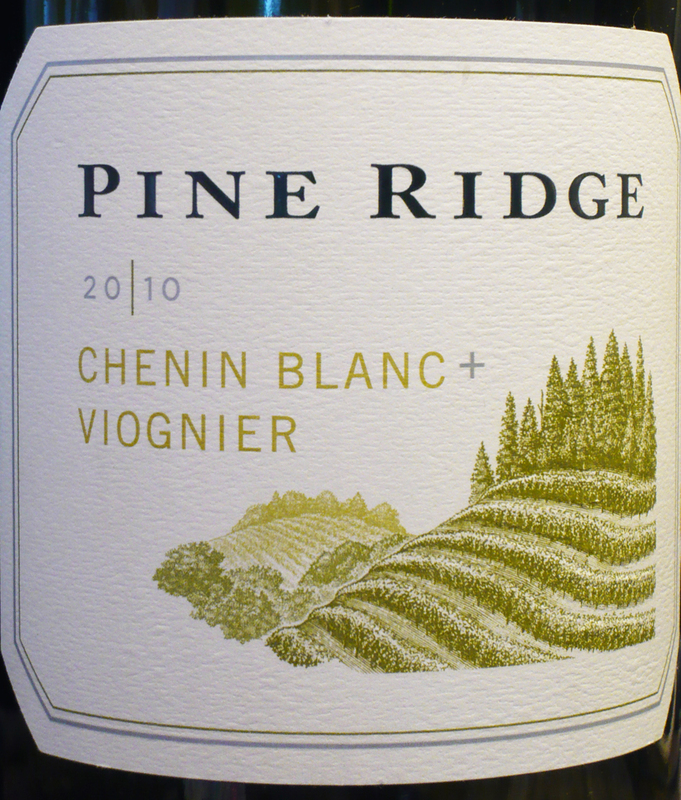 2 Responses to HIGHLY RECOMMENDED: Pine Ridge 2010 Chenin Blanc + Viognier (79% Chenin Blanc, 21% Viognier), California. 13% ABV. $13.99; available for as little as $8.99. I live in Fl… Where to buy?